Use Microsoft Reporting Services to create and publish powerful reports based on your SAP data without any additional staging layers. The Xtract RS data provider gives you access to SAP tables, queries, BAPIs and BW Cubes. Xtract RS is a data provider for SAP that is optimized for Microsoft Reporting Services as well as Power BI Report Server. 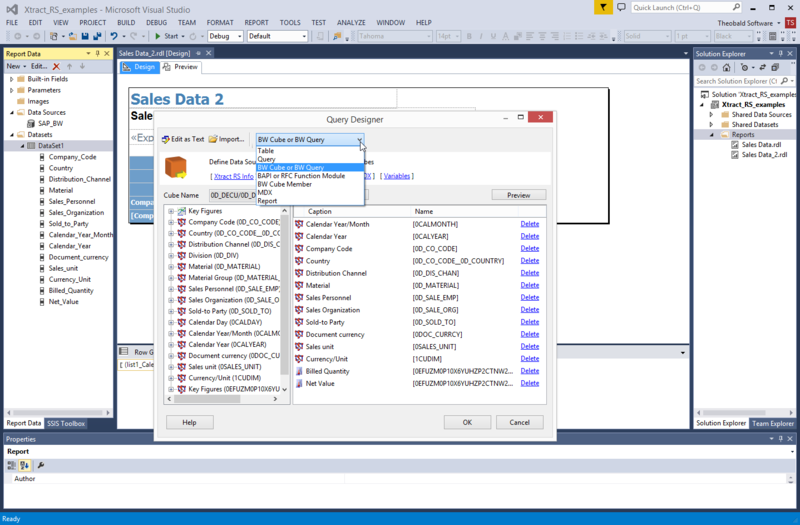 As a so-called data extension, it integrates itself seamlessly in the SQL Server Data Tools (SSDT) for Visual Studio. In this way the SAP data are available in the Reporting Services Server and the Power BI Report Server. Access is made in real-time and because it is direct, it is free of additional software layers and other middleware. When it comes to performance, this simple yet effective architecture can’t be topped. The following image shows the SAP query data source at the time of design. The input parameters can simply be linked with reporting parameters. Report variants are naturally also supported. The following screenshot shows a BW query being called. The necessary dimensions and key figures are simply dragged into the query output and are then available in the data set within the report designer. Of course, query variables can also be linked with reporting parameters. The preview shows how the reporting parameters are also filled from the cube and then directly transferred to the BW query. 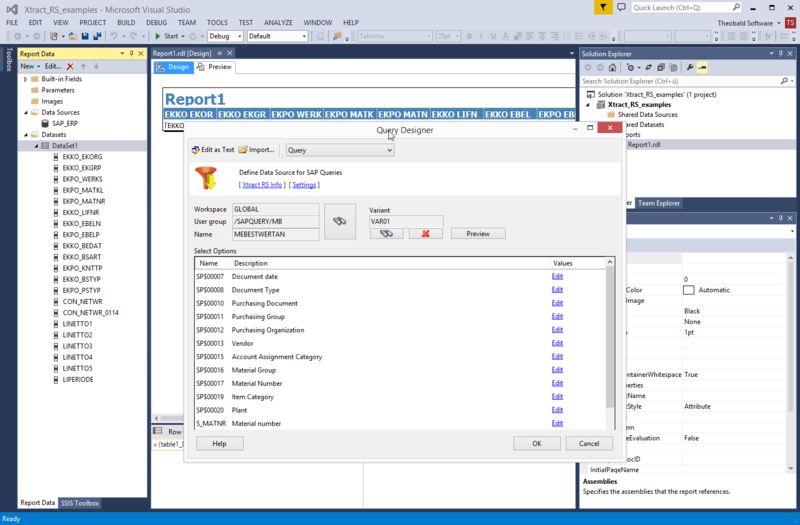 Full integration in Reporting Services Designer as a part of the SQL Server Data Tools (SSDT) for Visual Studio. 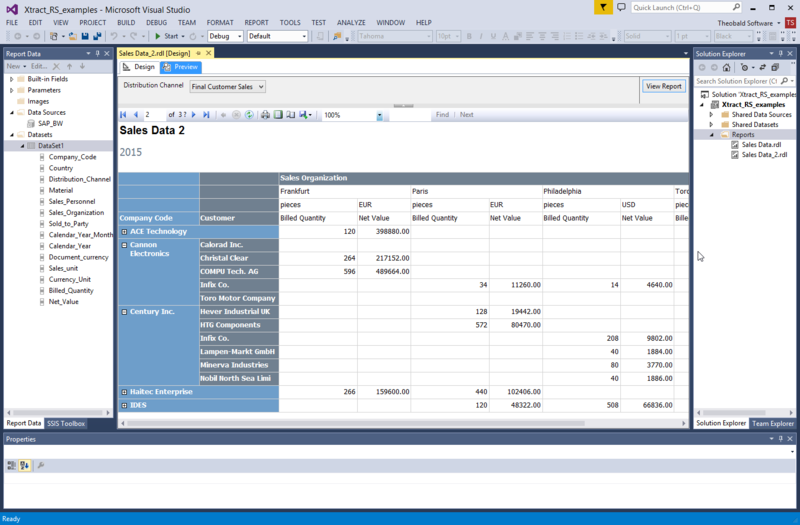 Entire compatibility to all SSRS-Features like Subscriptions, Report-Parameter, Shared Data Sources etc. If you can’t find an answer here, please write to us at support@theobald-software.com. Is Xtract RS certified by SAP? Xtract RS is based on our SAP certified product ERPConnect. 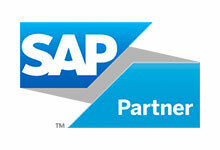 Do you offer consulting services for my SAP-interface as well? Yes. We provide the consulting you want and need. From a single-day workshop up to a complete interface solution. Please contact us at info@theobald-software.com.